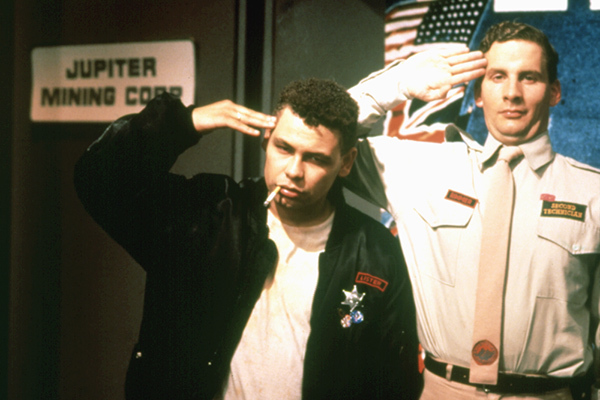 Red Dwarf began life when writers Rob Grant and Doug Naylor decided to script a radio sitcom based loosely on a series of sketches called "Dave Hollins: Space Cadet" from their Radio 4 series Son of Cliché. After passing the script around several possible producers and broadcasters in the early 1980s, the show finally found a home at BBC North in Manchester, under the auspices of Paul Jackson and Peter Ridsdale-Scott. Although several hiccups threatened to derail proceedings - including an electricians' strike that nearly saw the show cancelled altogether - the first series was finally recorded in late 1987 for broadcast on BBC2 in February 1988. Series I borrowed the "lonely astronaut in deep space with a deranged computer" aspect of Dave Hollins, and some of the jokes to boot - but otherwise, had very quickly developed into its own unique style and setting, helped partly by the various casting decisions. 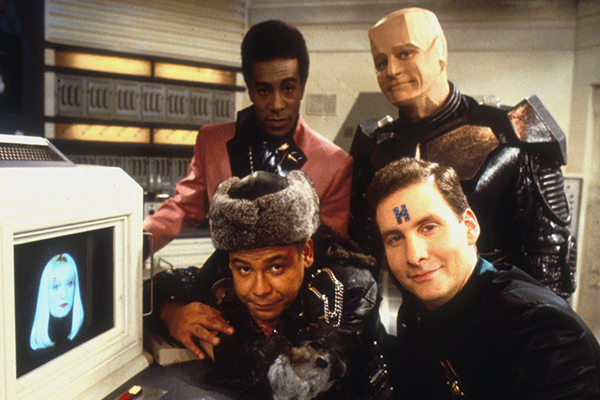 We were introduced to Dave Lister (Craig Charles), who became the last human being alive when a radiation leak wiped out the rest of the ship's crew; Arnold Rimmer (Chris Barrie), his stuffy and officious bunkmate, resurrected as an intangible hologram; the Cat (Danny John-Jules), the sole survivor of a race of humanoid felines who evolved in the cargo bay over a span of three million years; and Holly (Norman Lovett), the ship's increasingly senile computer personality. Amid the deliberately claustrophobic and somewhat dingy setting, the first series of Red Dwarf set out its stall as a character comedy, and focused on the lead pair's reactions to being placed in such an unusual situation, as well as coming up with some unique sci-fi story concepts, such as in the episode "Future Echoes". As promising as the series was, however, it may not have been seen as enough of a hit to warrant a second series - early ratings of four million viewers had tailed off considerably by the end - had it not already been commissioned. Red Dwarf II followed hot on the heels of the first series - recorded in June 1988, it began broadcast in September - and continued in much the same vein, but Rob and Doug were able to take their experiences working on the first series and figure out which areas needed improving. The sets were brightened up slightly, and the crew were allowed to leave the ship more often. There was also more depth given to the characters and backgrounds of both Lister and Rimmer - and the writers even broke their self-imposed "no robots" rule to introduce the mechanoid Kryten for a one-off appearance. The show was beginning to hit its stride, and it was less of a surprise to see it recommissioned again. Before Series III, however, there was the small matter of the first Red Dwarf novel. Later referred to as Infinity Welcomes Careful Drivers (the wording of a sign displayed prominently on the book's cover art) the book combined elements of several episodes from the first two series, while also greatly expanding on the background of both the world and its characters - particularly in a lengthy section detailing Lister's life before joining the Red Dwarf crew. Published by Penguin in November 1989, it was an immediate bestseller. Immediately after the publication of the first novel, Red Dwarf III hit screens - but this new series, filmed in Autumn of 1989, rang in the changes on a huge scale. After the positive reaction to his first appearance, Kryten was brought back as a recurring cast member - with actor Robert Llewellyn replacing the previous incumbent David Ross - while Holly gained a new face and gender, now played by Hattie Hayridge in place of Norman Lovett. The sets and costumes were given a drastic overhaul courtesy of a new design team, and there was even room for a new craft - the iconic Starbug - to be introduced. While all of this was going on, meanwhile, Grant Naylor Productions became a standalone entity, producing the series rather than it being an in-house BBC project. 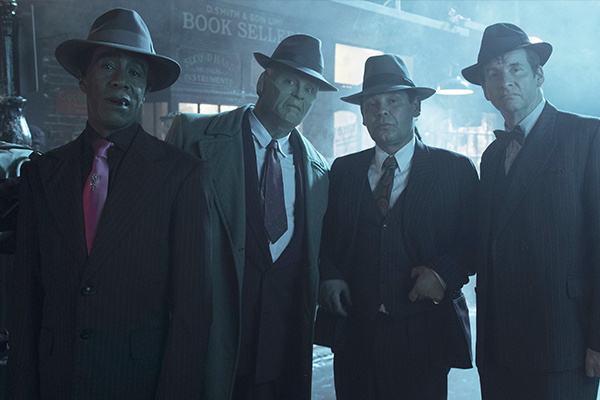 A similar aesthetic and style was carried through to the fourth series, although another major change behind the scenes saw the show move from the BBC Oxford Road studios in Manchester, to the famous Shepperton Studios in Surrey. The show's backstory began to fold in elements from the first novel, while a second book - titled Better Than Life and published in October 1990, around a month before Series IV began recording - even gave an entire plot to one episode, "White Hole". This series also introduced Ace Rimmer, Arnold's dashing parallel universe counterpart and a hugely popular character with fans. The show was again based at Shepperton for Series V, produced in winter 1991 and broadcast in early 1992. Long-time director Ed Bye was unable due to scheduling conflicts, and so the series was directed by a combination of newcomer Juliet May, and Rob and Doug themselves. Once again, enduring elements were added to the mythos by this series - which positioned the show as even more of an action-adventure setup than before - most notably another alter ego, this time the Cat's nerdy other self Duane Dibbley. Duane debuted in the season finale, "Back to Reality", which briefly teased at threatening to write out the entire crew altogether (!) and which consistently tops "Best Episode Ever" polls. There was a longer gap than usual between the fifth and sixth series, in part due to Grant Naylor Productions' attempts to get a US remake of the series off the ground. With only Robert Llewellyn travelling with them across the pond to resume his role, Red Dwarf USA failed to make it past the pilot stage - but the experiences (both positive and negative) working in an American TV setup informed the writers' decisions for Series VI. The fifth series had already seen an increasing focus on exploration outside the ship - and the sixth took this even further, cutting them loose from Red Dwarf entirely as they instead drifted through space in the smaller Starbug. This change in format - which also saw Holly written out of the show, to the disappointment of some fans - enabled a tightening up of the character comedy (particularly with the series' recurring cockpit scenes) at the same time as opening out the story scope to even more outlandish concepts. The Western-inspired "Gunmen of the Apocalypse" won the show an International Emmy Award, while the finale "Out of Time" was a bold and daring adventure that saw the crew apparently coming a cropper after a devastating encounter with their evil future selves. The wait for that cliffhanger to be resolved, however, was a near-unbearable one for fans: Series VI had been broadcast in October 1993, but production on Series VII didn't begin until Spring 1996, eventually seeing broadcast in the first two months of 1997. Behind the scenes, the show had seen some of the biggest changes in its history: co-creator Rob Grant decided to leave the Grant Naylor partnership, and with it Red Dwarf, so the expanded run of eight episodes was now written by Doug both solo and in conjunction with several guest co-writers (including Robert Llewellyn). Chris Barrie had also decided to call it a day, and it was agreed that Rimmer would appear in only four episodes. And the show was now filmed (with Ed Bye returning once more to direct) on a closed, four-walled set - allowing for a more cinematic look and feel - with episodes then shown to an audience in their completed form to record the requisite laughter track. Series VII, then, was closer to a comedy-drama than the sitcom stylings of the previous six series, and although there was a healthy amount of outdoor and location shooting, much of it also had a dark and claustrophobic feel. To replace Rimmer, Chloë Annett was brought in as a parallel universe counterpart of Lister's lost love Kristine Kochanski (previously played in Series I, II and VI by Clare Grogan) - although the two actors did pass each other on the way out and in, appearing together in flashback scenes in Chloë's debut, "Ouroboros". Rimmer's departure came as he took on the role of Ace Rimmer - revealed in the second episode to be an ongoing mantle passed on from dimension to dimension - and there was a growing focus on the characters' backgrounds and origins. "Ouroboros" revealed the surprise, time-bending twist that the father who had left Lister under a pool table as a baby was none other than Lister himself; and "Beyond a Joke" filled us in on a bit more of Kryten's history while also introducing his "brother", Able. A planned episode which would have seen us finally meet some of the remaining cat people, meanwhile, was ultimately shelved. On the screen, however, Chris Barrie's character was far from finished. He had enjoyed working on Series VII so much that he reversed his decision to leave, and agreed to return for the eighth series in 1999. The cliffhanger at the end of the last series had seen the crew apparently rediscover Red Dwarf - in fact, the ship had been rebuilt by "nanobots" that had initially stolen and reduced it to atoms - having first also re-encountered Holly (now played again by a returning Lovett). In Series VIII, we discovered that they had also resurrected the entire ship's crew - including Rimmer, whose personality was now restored to his pre-accident self - and through a complicated set of events, our heroes found themselves condemned to hard time in the ship's brig. Returning to a more traditional sitcom-style setup - including going back to filming in front of a studio audience - the eighth series attracted record ratings for a BBC2 sitcom. It was, however, the last series of the show (to date) to be broadcast on the BBC - as, despite its cliffhanger ending (which apparently saw Rimmer on the verge of death again) Doug and the crew spent the first half of the next decade attempting to get a feature-film adaptation of the series off the ground. After a series of near-misses (many of which were detailed in the news section of this very website!) however, the project has yet to reach fruition. In the meantime, repeats of the show on the UK digital channel Dave were among the broadcaster's most popular hits - and so it came to be that owners UKTV entered into discussions with GNP about producing a celebratory anniversary special. Initially planned to be structured around a clip show-style format, the special instead blossomed into a three-part miniseries called Back to Earth, which was broadcast over the Easter Weekend in 2009. The show picked up the story nine years after the end of Series VIII - with the rest of the revived crew missing, and Holly offline, while Rimmer was now back to being a hologram and Kochanski was also missing, presumed dead. Deliberately, Doug chose not to spend time explaining everything that had happened in the years since - instead concentrating on re-establishing the characters and providing, in the shape of a fourth-wall-breaking alternate reality story, a springboard for Lister to shake off his lonely ennui and look towards an optimistic future. Perhaps the most talked-about element of the special, though, came as the crew travelled to the set of a U.K. soap called Coronation Street, bringing Lister face to face with none other than the actor Craig Charles! The three-part special (which was later released on DVD and - in a high definition first for the show - Blu-ray in a feature-length "Director's Cut" format) shattered ratings records for original digital commissions in the UK, and made the eventual commission of a new full series an inevitability. Series X went into production in winter 2011, for broadcast on Dave in autumn 2012. Just as he had done on the specials, Doug served as sole writer and director. Where Back to Earth had been shot on a closed set and on location, for the full series revival the show went back to recording in front of a live studio audience, energising the performances of the cast. Once again, the series concentrated on maintaining a "classic" setup with the four main cast members, but thematically had a particular emphasis on their family histories (notably, introducing one of Rimmer's brothers as a proper onscreen character for the first time, and also exploring in more detail Lister's reaction to discovering his unique parentage) as well as establishing a series-long subplot of Lister trying to track down Kochanski. That plot thread, however, was left unresolved - and the season finale instead focused on the surprise revelation that Rimmer's father was not actually the man he'd always believed (although nor, we should hasten to add, was it Lister). Whether that reveal will have major consequences for Rimmer's character, though - and whether Lister will ever be reunited with Kochanski - were questions for potential future series. The wait between Series X and an eleventh series that seemed inevitable once the tenth had attained still further ratings records on Dave was longer than anticipated, thanks in part to scheduling issues with reuniting the cast and crew. In May 2015, however, it was announced that not one, but two new series would be made back to back. Series XI and XII, now a co-production between Grant Naylor Productions and new partners Baby Cow Productions, went before the cameras in late 2015 and early 2016, with Doug once again writing and directing all twelve episodes. 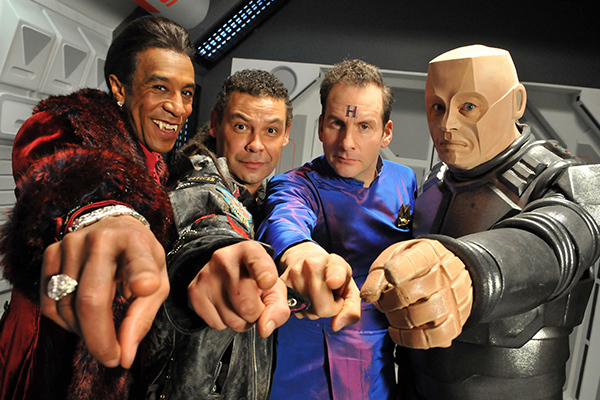 The new series featured an array of guest stars and yet more imaginative and adventurous plotting, and upon its debut in Autumn 2016 became the first new Red Dwarf episodes to preview online before their regular transmission on Dave. While it remains to be seen if Red Dwarf will continue beyond 2017's Series XII, the omens certainly look good. Almost thirty years after its debut, the show continues to delight fans both old and new - and there's no reason why, for as long as everyone involved wants to keep making it, it can't keep going on from strength to strength.